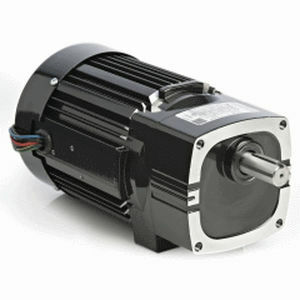 The 48R-F series by Bodine Electric Company is a Parallel shaft AC helical gear motor which features its motor that is totally enclosed and has a protection class of IP20. For this specific model, it is equipped with a fan cooling system for high output power. For its insulation system, it has a class "B" rating that is operating within a class "A" system. With thIS functionality, it increases the winding and lubricant life of the system. Also, it comes with an Aluminum center ring and end shields for high thermal efficiency and light weight. A needle bearing is also included in the unit enabling it to increase it radial load capacity and durability. For a more quiet operation, its helical gearing is hardened.